In the past few days, the number of armed provocations by Russian-terrorist forces in Donbas has reduced somewhat, while militant infantry groups and sabotage and reconnaissance units continue to be active in certain areas. Several militant infantry groups (each numbering 15-20 personnel) are active again in the “neutral zone” and on the front line near Zaitseve (north of Horlivka). The militant groups are carrying out maneuvers and surveillance. Firing in the direction of the Ukrainian positions with small arms has been reported. Similar terrorist groups are operating near Berezove and Novotroitske (south of Donetsk). In addition, several 82 mm mortar rounds were fired from positions behind the militants’ lines along this stretch. On the front line, near Sakhanka and Shyrokyne, movement of militant infantry groups and transportation of weapons to new positions were observed. 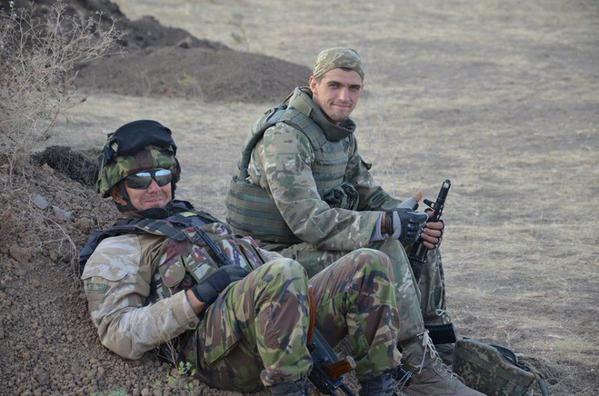 Activity by terrorist sabotage and reconnaissance units was recorded north of Myronivske and Troitske. Militant scouts and sniper units have been spotted in the sectors southeast of Krymske and near Shchastya, Stanytsia Luhanska and Syze. Near Spartak, militant artillery weapon positions (eight type 2A65 “Msta-B” 152 mm guns) have been identified 10 km from the demarcation line. Observed in the same area were six “Gvozdika”122 mm 2S1 self-propelled guns in marching formation. Between Khartsyzk and Zuhres (close to Hirne), two militant “Tor-M1” air defense missile systems were seen on the march. Vetting of staff of the so-called “Ministry of State Security of the Luhansk People’s Republic [LNR MGB]” has begun, with the aid of psychologists and a lie-detector. The first round of checks is being done on staff members hired from the local community, in order to uncover agents of the Ukrainian special services and law enforcement agencies. Up to 10 employees of this department undergo the check every day. A meeting of representatives of “LNR” institutions was held in Rostov-on-Don (Russian Federation), led and managed by the Kremlin’s “overseers.” The main issue on the agenda was tariffs and pricing for municipal services and public transport in the occupied parts of Luhansk oblast. The Kremlin “overseers” ordered that “the leaders and members of the National Council of the LNR” should only review “legislative bills” or amendments after they had been approved by the Presidential Administration of the Russian Federation.